*****5-STARs! 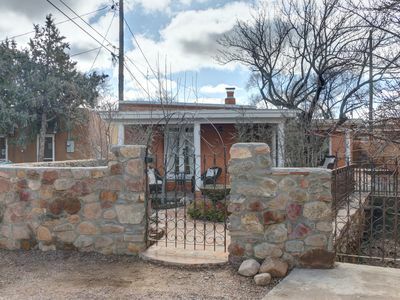 Air-conditioning, great neighborhood, around the corner to Canyon Road, 3/4 mile to the Plaza. This is a dog-friendly property. 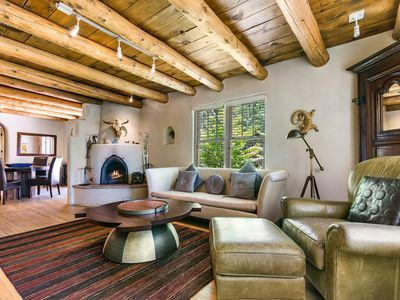 Stunningly perched above the valley floor with sweeping views and a swath of blue sky above, the sun-drenched deck blends to the inside great room creating a laid-back western respite. 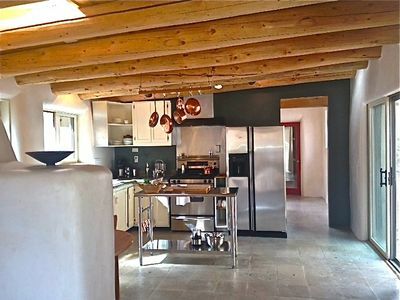 Soft earthy tones against leather assure your comfort and the well-equipped kitchen is ready for the invisible chef. 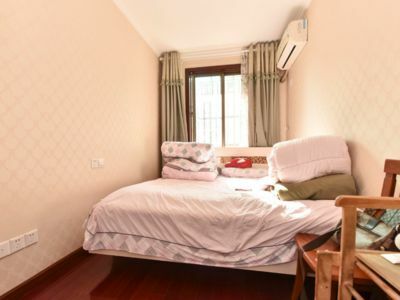 With one bedroom/ensuite bath on the main floor, passage to two more bedrooms, each with ensuite baths, is up a few stairs and through antique doors. 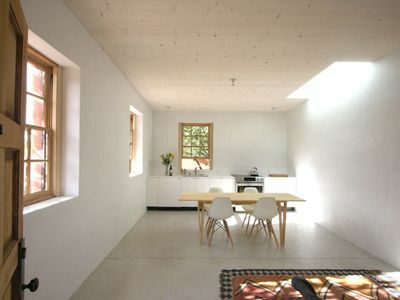 At the end is a separate but attached casita with a sofa bed. 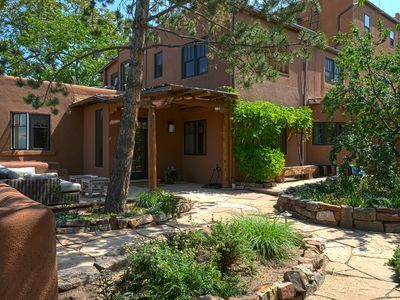 Feel the New Mexico landscape as you follow the winding path to Canyon Road galleries, sumptuous Restaurants and El Farol, an old-timey dancing bar. Dogs invited and a small 4-wheel drive SUV works best. 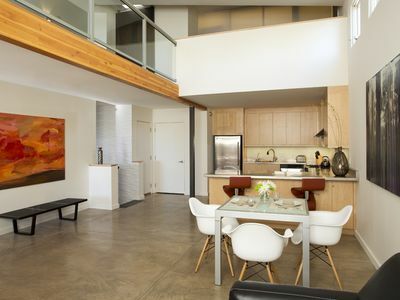 HOTEL-LIKE in its own way, each AQUI home is favored with freshly pressed custom PRATESI linens, premium beds, designer ETRO amenities, gracious and discreet service, professional housekeeping, our special AQUI "Breakfast Basket" for you and of course off-street parking. 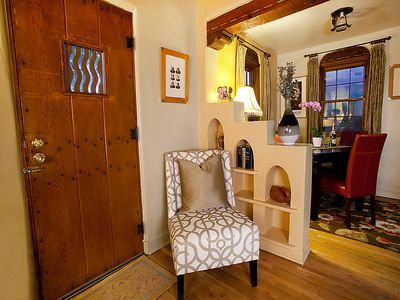 For your comfort, all homeowner personal belongings are tucked away and out of sight. FLOOR PLAN. Set atop the hill, a open sunny deck welcomes you to the house and becomes an extension the great room for an ever-present view. The master bedroom is set to the back with a few steps up to the other two bedroom suites and attached casita with a separate entrance. LOCATION. 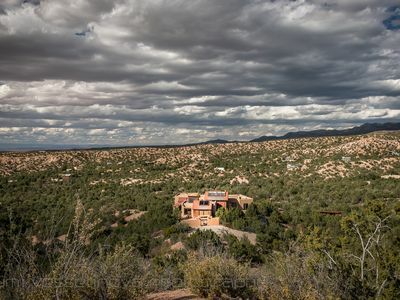 Walk the New Mexico landscape from a rural-like location past an age-old private chapel, down a few blocks to the end of Canyon Road, to a wonderful church built with the hands of its parishioners, to some of our best restaurants and galleries. This is "local" territory! WHY SHOULD LOS PICOS YOUR BE YOUR FIRST CHOICE? AQUI values your vacation time and looks forward to enhancing your stay. 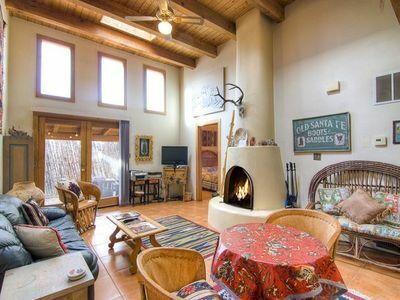 You will have the comforts and conveniences of home but with a Santa Fe experience. 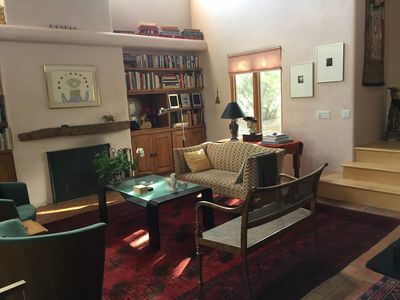 The location is first and foremost; being a few minutes from Canyon Road with three of our best restaurants: Geronimo, El Farol, The Tea House in addition to world-class galleries is the BEST! TRUTH BE TOLD. 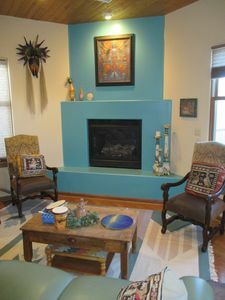 “Our family has stayed with AQUI Santa Fe many times and always enjoyed the quality of their homes. 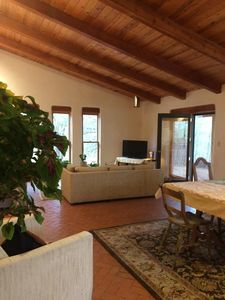 This time we got to bring our dog, all the kids had their own bedrooms, their own TV room in the casita while we enjoyed cocktails on the deck with a view. It doesn't get any better than that!" AQUI SANTA FE WELCOMES YOU. You will receive directions to the house two weeks prior to your arrival. Drive directly to the house where Caroline will meet you with keys and a brief tour to assure your comfort with the house. Confirm your departure the night before leaving and Caroline will be back again to close up the house and bid you a fond farewell. THANK YOU FOR CHOOSING LOS PICOS. We look forward to ensuring a memorable vacation where peace of mind is among the many amenities. WHO IS AQUI SANTA FE? Our Spanish influence prompts us to say, AQUI (“ah-ki” It means “here”. 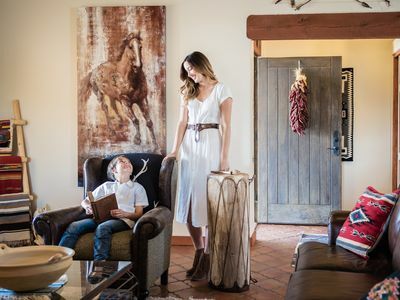 Your Santa Fe experience starts “here”. 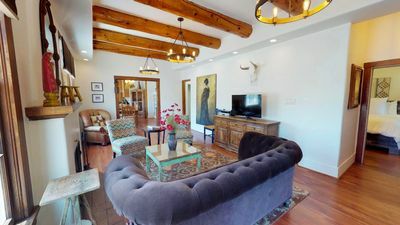 This unique company maintains a portfolio of carefully selected Santa Fe vacation rentals, each distinct in character and authentic to its culture, as it continues to tell its own special story. 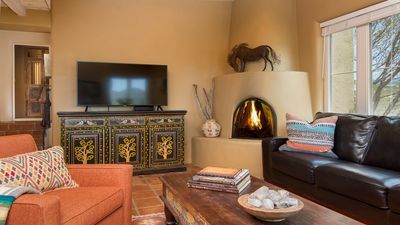 Its signature style of impeccable service and quiet luxury speaks softly while creating an enriched experience for its discerning guests who enjoy vacation rentals in the Santa Fe Historic District. 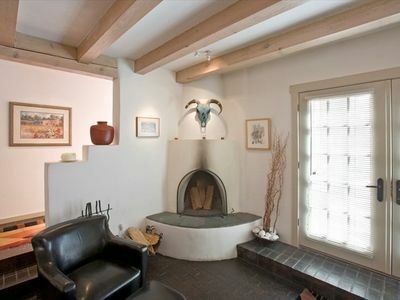 Caroline Morgan, the owner, is a Licensed Real estate Broker in the State of New Mexico. 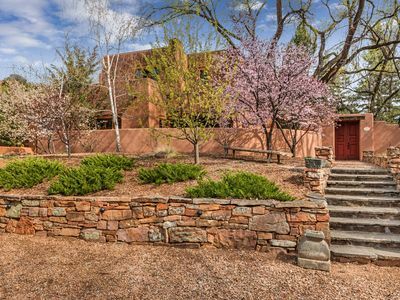 Casa Bisonte -Pueblo style Casa in great eastside location w/ mountain views! 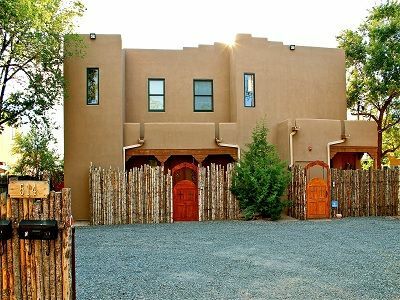 Historic Adobe -Best Location - Walk Everywhere, Private Hot Tub.Winter Special! 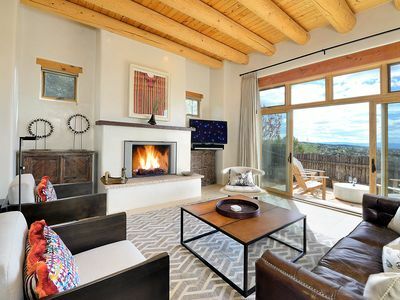 Enjoy Gorgeous Santa Fe Sunsets with Pool Access! 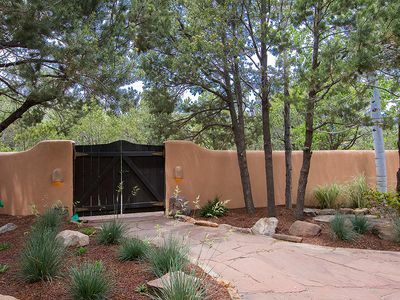 Casa Montoya Vista - Just Blocks from Canyon Road!